"My brother taught me this recipe, and I love it so I decided to share this wonderful recipe with you." Sift together the flour, 1/4 cup confectioners' sugar, and cinnamon. Use a pastry cutter or two forks to mix in the butter until mixture resembles fine bread crumbs. Stir in the orange zest. Sprinkle with ice water, and gather dough into a ball. Roll out on a lightly floured surface to 1/4 inch thick. Cut out approximately 18 (3 inch) diameter circles, and 18 (2 inch) circles, rerolling dough as needed. Line muffin cups or tart tins using the 3 inch pastry circles. 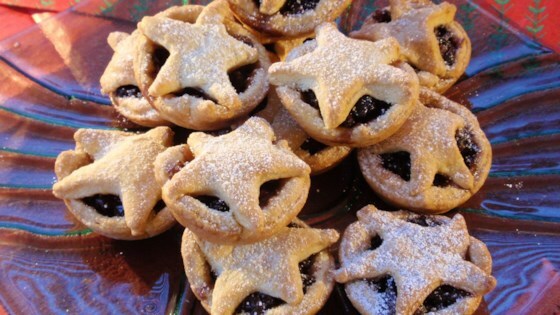 Fill each pastry cup with about 1 tablespoon of mincemeat filling. Top with 2 inch pastry circles, pinching circles together to seal the edges. Brush the top of each pie with egg. Bake pies in preheated oven until tops are golden brown, 15 to 20 minutes. Cool slightly on wire racks. Dust with 1/4 cup confectioners' sugar just before serving. Easy mini apple pie tart recipe with fresh apple, cinnamon and almond. Great recipe...I also used orange juice in place of water in the pastry. Thanks for sharing the recipe. I made these for my husbands family who love mince meat. They all loved them. My husband wants me to make him more for his birthday. This really was a wonderful recipe. Thank you! I really liked these. Yummy! In fact, I couldn't stop eating them! I used fluted rings to cut the dough and I didn't really seal them, I just let the tops sit like little hats. Great recipe! Super easy, delicious and really tasty. It was a lovely surprise, I did not expect this recipe to work for me that much. The orange zest is a must. Enjoy! Fabulous crust recipe!! !I will have to triple what I made last Christmas as my British husband eats these pies like pop corn! !